Wine brewing kits are the miniature equivalent of our modern wineries. They allow people to make wine from frozen grape juice or concentrate, with the perspective for them at the end to enjoy their own wines. It seems that the apprentice winemaker loves to follow the steps of the efficient, square enologist who doesn't leave a chance to the juice to become wine by itself (never leave free reins to your wines, they'll get faulty, everyone knows that...). I don't know if this is the trend worldwide but in France I noticed that the home gardener is the biggest user of weedkillers when you consider the ratio of herbicide volumes to the treated surface. I'm wondering if home winemakers are similarly mimicking the wineries by using the full range of pharmacopoeia developed by the additives companies, only that they overdo the corrections and use this stuff in even larger dosage than wine-school-educated professional vintners. On the weedkillers issue like on the winemaking additives, it seems that a large part of the problem is the propensity of the average citizen to prefer the straightforward chemical approach, the fight-and-get-them philosophy, rather than the pragmatic, more easygoing mindset. Of course the additives companies have been pushing a lot in this direction, but they wouldn't have much leverage if there weren't so many of us addicted to this spraying/correction rationale with which we're mostly shooting ourselves in the foot with dead soils and fake wines. Just have a look at this range of additives found on a now-offline webpage. These are designed for home brewing but they're more or less the types of products used discretly by our modern commercial wineries worldwide. In conclusion, I'd like to ask : what's the point for an individual to make the leap to set up his own miniature winemaking operation if he ends up correcting his wine at every turn like it's done for the wines he buys in the wine aisles ? "Adds a pleasant tartness"..."Almost all wines need additional acid"
"It's a good natural preservative"
"Adds astringent flavor and some color"
"to increase body and mouthfeel to wine"
"Add after fermentation, and after siphoning wine off of the settled yeast"
"for more alcohol, body, & flavor"
"concentrated blend of white wine grapes"
"designed to give young or harsh wine a smoother character"
"it prevents renewed fermentation after sweetening"
"this is so powerful it can be sprayed onto large items"
"only way to clear the permanent haze"
"Add to wine before or after fermentation"
"For proper yeast cell multiplication"
"Also good in non-grape fruit wines"
Yes, It is the same in the USA. The people at the local Homebrew store told me I was going to destroy my cider if I didn't use packet yeast, Yeast nutrient and and all sorts of tabs to start and stop fermentation. Wine consumers were not informed by any additive added in the back label bottle they bought,we were not knowing which exactly chemical additive we intake.The wine law should be enforced to make every winemaking industry to honestly disclose their additives.This is fair to the buyers! At least one winery try to use as much additives to improve his weak poor grapes to cult wines, they should stay saying they are making good additive improved wine that will more probabily with exagerate fruit bomb,oak and mouth feel that won 90plus critics point! Ah!I missed those natural wines. Great blog. It's a nice read. I am a home winemaker in Oregon. 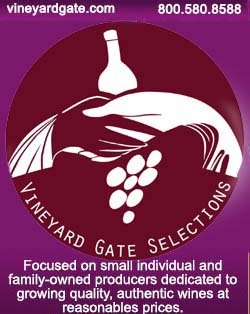 Home winemakers have access to most of the additives that commercial wineries do. I used quite a few of them myself. After reading your blog over the past couple of years I have really started to reduce the additives I use in my winemaking. Now I use commercial yeast, yeast nutrient, sulfur (SO2), and occassionally oak chips (for color rentention). I use low levels of sulfur. At some point I might cut out the use of commercial yeast and the nutrients. I get quality grapes from a vineyard in Washington that does minimal spraying. For now I am pretty happy with the results. Hello Bertrand, I, too am a home winemaker. It's given me a good appreciation of the work of "genuine" winemakers. Unfortunately the variety of local grapes is limited, so I make do with kits, with their industrial grapes and additives. In general, the kits make drinkable wine, for a modest price - $3 to $6 per bottle. Good for parties, and for general drinking/cooking. I've found that they don't always last long, especially if I don't increase the level of sulfur at bottling time. I also get juice from the local winery. That's a bit more fun, but I doubt that our local viniculture is well-enough advanced that I can count on indigenous yeasts, so I add packet yeast. One does what one can. The important thing is to enjoy what we drink, and respect the artisans who bring it to us. Thanks for your comments, especially from those of you who are home winemakers. It's by the way odd that there are few home winemakers in France, I mean you don't see people here in cities making wine at home from purchased grapes (or frozen buckets) like people in Canada and the United States do. I was amazed when I discovered that you could have frozen juice from selected vineyards in California shipped anywhere in the US and for example also abroad like in Ottawa, allowing the amateur winemaker to try his talent event months after the harvest took place. I'm not even sure that it is legal in France although historically people have been making wine all over without needing a licence. The fact that so many people make their own wine helps the general "wine culture" of the country grow, even when you take into account this additives issue. This is a very interesting post. You are right to state that, at least in certain countries, home gardeners are responsible for a greater use per square metre of pesticides. Scientific studies have proven this. I suspect that the same is true of home winemakers. And I totally agree with you when you ask 'what's the point for an individual to make the leap to set up his own miniature winemaking operation if he ends up correcting his wine at every turn like it's done for the wines he buys in the wine aisles?' Surely the advantage of making your own wine is to have a wholesome wine to enjoy without the danger of consuming additives that may (at least) mask the character of the fruit or (at worst) be harmful to the drinker. I would differ with you a little about the assumption that the 'efficient, square enologist' or the 'wine-school-educated professional vintners' are always committed to using intervention in winemaking or a sort of formula to make wine. To make my point, I must first start with a confession: I first made wine some decades ago at home and, since I didn't really understand the science of fermentation, I followed the advice of 'experts' (the makers of these additives, not other winemakers) and I used all the advised additives - sulphur, sugar, acid, vitamin C, fining agents etc. The results were not good. Today I still have a lot to learn but I have spent a couple of recent years studying viticulture and oenology. I now know enough wine science to know when NOT TO INTERVENE in the vineyard or in the winery and to react in a patient and measured way to allow the wine to evolve its own character. College taught me to tolerate a certain level of pest in the vineyard, to encourage beneficial insects that prey on the pests, to look after the micro-organic life of the soil and to use my knowledge to let the grapes express themselves in the wine. Maybe this is because I did my studies recently and wine education is maybe more environmentally aware than in the past? I don't know. I know there are still vignerons and winemakers who apply pesticides/additions preventatively (i.e. BEFORE there is a problem) but, in my experience at least, these are not people who have been to wine school. They do what their Dad did and what their Grandad did, and Dad and Grandad did what the sales representative from the chemical company advised without questioning the advice because they knew no better. I shudder to think how dead their vineyards are, after decades and decades of chemical treatment. When I work in a vineyard, I observe the progress of the vine and watch out for pests and disease, I monitor their progress and calculate the risk. I work with low yields and try to produce high quality fruit so that I can produce high quality wine - you've heard the expression 'wine is made in the vineyard'. I only intervene when the risk to the vine/fruit/vendange of not intervening is too great or too costly in terms of quality or yield (yes yield, because even though I work to produce low levels they cannot be TOO low - I cannot remain as a winemaker if I cannot pay my bills!). In the winery, I avoid circumstances that will harm the wine (uncontrolled oxidation, contamination etc) so that I don't need to intervene to address un-necessary problems - as the saying goes 'prevention is better than cure'. I think this short article is one of the most important you have written Bertrand because it also reaches beyong the world of wine and makes us think about the use of pesticides in our gardens and vegetable plots and I hope will make people think also about additives in food in general. Sorry for being so long-winded but you have touched on a very important subject. Well done. Thank you very much for this comment, this is very useful and contributes on the subject ! This is interesting to learn that the wineschools tend to be more moderate on intervention. I noticed myself on the other hand also in France that winemakers who had inherited their winery from their dad and grand-dad and hadn't been to wine schools (or had been there just for the form) were indeed high users of all the stuff, both in the vineyards and the cellar. Another question is : What will be the policy of the additives companies if the wineschools don't push less and less for intervention ? They have been making lots of money in the trade and they also have been helping fund wine schools and enology departments in universities here and there, and it will be interesting to see how they're going to switch their strategy to stay afloat if there is really a diminishing use of additives (which I keep doubting to be frank).